In recent years, payment industry stakeholders in the U.S. have been collaborating to improve payments efficiency. A quest is underway to achieve the worthy goals of originating and receiving more payments electronically to reduce the average end-to-end costs of transactions and to enable innovative payment services for consumers and businesses. In the U.S., opportunities to improve payment system efficiency are especially significant in business-to-business (B2B) transactions, which include the invoice, payment and remittance detail. 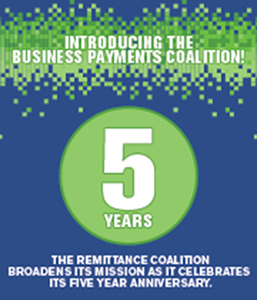 With that in mind, give a hearty salute and wish a happy anniversary to the Business Payments Coalition (BPC), formerly the Remittance Coalition, which celebrates five years this month. The organization’s new name recognizes that its goal has broadened beyond simply facilitating the exchange of remittance information among B2B trading partners. It still seeks to foster adoption of electronic payments and remittances in the business-to-business environment, but its wider-ranging mission today is to improve efficiency of B2B payments across the end-to-end process. The Coalition consists of organizations and individuals working together to promote greater use of electronic B2B payments and remittance data exchanges, as well as other ways to increase B2B transactions efficiency. Over the last five years, the Coalition has developed a plethora of tools and standards that address the various challenges that businesses face when using electronic alternatives to paper-based payment options. As the payments environment continues to expand and new electronic payment options grow, the Business Payments Coalition has continually expanded its efforts beyond remittance to lend a fresh perspective to overall payments efficiency. Under the auspices of the Business Payments Coalition, various work groups drawn from over 550 BPC members will continue to work toward increasing the efficiency of B2B payments by all types and sizes of U.S. businesses. These efforts include the highlighted projects that follow. The recently released Volume 2 of the Small Business Payments Toolkit is a robust payments education tool for small businesses and the bankers and advisors who serve them. Volume 2 is chock-full of new information to further encourage electronic B2B payments and remittance information exchanges by small businesses. • Working with Your Banker has plain-language information on getting started with Automated Clearing House (ACH) origination, ACH returns and notifications of change. It now includes a sample trading partner agreement to start receiving ACH payments. • Fraud Prevention and Mitigation Tips speaks to bank services and other mitigation strategies that could help a small business combat payments fraud. • The expanded Resources section now includes ACH checklists and forms, bank holidays, regional payments associations, health care information and webinar links. Financial institutions, consultants, small businesses and anyone else interested in learning more about payments should download this free resource now. We encourage you to bookmark the Small Business Payments Toolkit as we will continue to release new volumes. Also, please send an email to Business.payments.smb@mpls.frb.org if you have any suggestions for information that should be included in future volumes. The Vendor Forum offers a venue for over 90 software and technology providers, corporates and financial institutions to collaborate on encouraging standards adoption to improve B2B payments efficiency and achieve straight-through processing. The Forum fosters dialogue, builds awareness and engages vendors and their communities to promote automation and electronification of B2B payments and associated remittance information. One of the Business Payment Coalition’s major accomplishments is the development of a B2B Directory concept that reduces the time, cost and complexity of gathering the information needed to send payments electronically. Checks are a popular payment choice for businesses because only the name and address of the payee are needed. Conversely, if a payor wants to pay via an electronic method like ACH, the payor must know the full bank account and checking account numbers of the payee. This information is often difficult to obtain. The B2B Directory addresses this challenge by providing a valuable new look-up tool that enables payors to obtain payee information easily and securely. Recently, to make the directory concept “real”, the BPC helped form the Business Payments Directory Association, a new 501(c) 6 nonprofit organization that will oversee implementation of the Directory. Visit the Coalition website to learn about the latest progress on the B2B Directory. Because the U.S. lags behind other countries in its usage of e-invoicing, a new project of the Business Payment Coalition is focused on promoting the adoption of e-invoicing by U.S. corporations. Viewing e-invoicing as an essential first step to straight-through-processing, a work group of subject matter experts will compile a catalog of e-invoicing standards by market segment, identify an exchange framework, and develop recommendations and a best practices guide designed to spur adoption of e-invoicing among U.S. businesses. The Business Payments Coalition page on FedPaymentsImprovement.org is updated frequently with helpful tools ranging from standards resources to free educational webinars. Check back often for new information and opportunities. Interested in joining the Business Payments Coalition? Register now! You will receive a welcome packet, be added to the Coalition distribution list and be invited to specific Coalition initiatives that may interest you. Have a question about the Coalition? Want to volunteer on a project? Review the Frequently Asked Questions (FAQs) or send an email to Business.payments.smb@mpls.frb.org. “ISO” is a registered service mark of the International Organization for Standardization.